Yes, Trump has a record of odious, irresponsible pronouncements. But Clinton has a lousy record. Hillary Clinton gives an address on national security on June 2, 2016, in San Diego, California. 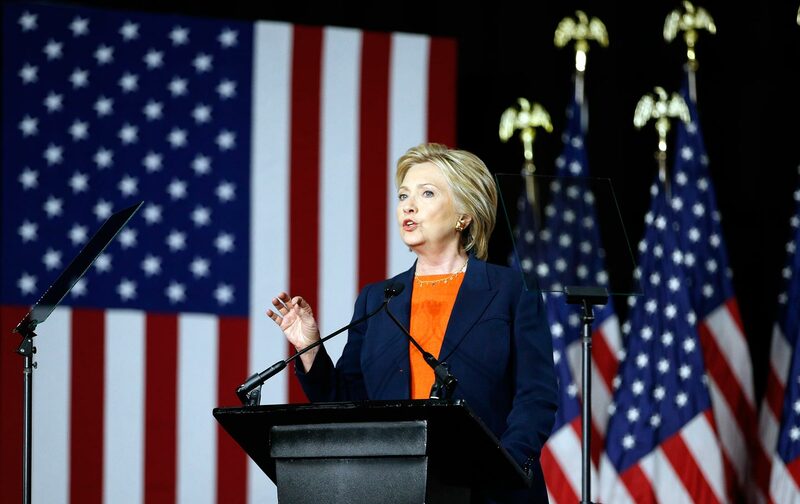 In San Diego on Thursday, the front-runner for the Democratic presidential nomination, former secretary of state Hillary Clinton, sharply rebuked her Republican rival, Donald J. Trump, for his lack of qualifications and foreign-policy smarts. Departing from her standard and often dull stump speech, Clinton issued a brutal and, at times, clever critique of her Republican opponent. Yet, as she drew out the differences between herself and Trump, it became depressingly clear that she is offering nothing new. Mrs. Clinton told an adoring crowd that Trump simply “cannot do the job.” Trump’s ideas, according to Clinton, “aren’t just different—they are dangerously incoherent. They’re not even really ideas—just a series of bizarre rants, personal feuds, and outright lies.” In sense, Clinton—of Illinois, Arkansas, New York, and Washington, DC—was on home turf in San Diego, which plays host to some of the biggest players within the military-industrial complex. Defense contractors like BAE Systems, General Atomics, Cubic Defense, and Northrop Grumman contributed, according to one San Diego–based trade group, an estimated $24.8 billion to the local economy last year. All in all, devastating and formidable. Yet problems arise when Clinton rolls out the charge that Trump is “temperamentally unfit” for office. Perhaps he is. But her record also raises serious questions of judgment. And here a consideration of Secretary Clinton’s record in office is in order. New York Times reporter Mark Landler recounts in his recently released book Alter Egos: Hillary Clinton, Barack Obama and the Twilight Struggle Over American Power that on nearly every major foreign-policy decision that Clinton weighed in on during her time as the nation’s chief diplomat, she found herself to the right of the Pentagon. A former aide recounts that Clinton “contributed to the overmilitarizing of the analysis” with regard to the president’s options in Afghanistan. Clinton initially backed Gen. Stanley McCrystal’s request to send 40,000 troops there and was among on coterie of advisers who forced President Obama’s hand in sending 30,000. Doing so resulted in, among other things, a wave of “green-on-blue” attacks on American service personnel by our alleged Afghan “allies.” Not surprisingly, twice as many US servicemen were killed in Afghanistan under Obama than under George W. Bush. Still worse, in the summer of 2010 she seemed positively eager to provoke a crisis with China, joining with then–Secretary of Defense Bob Gates in urging the president to divert an aircraft carrier to the Yellow Sea in response to a North Korean torpedo attack by a South Korean naval vessel. According to Landler, Clinton was undeterred by a warning from the Chinese not to divert the American carrier, and, quoting Vince Lombardi, exclaimed to her aides, “We’ve got to run it up the gut!” The president wisely demurred. And then there is her continuing hawkishness with regard to Iran. Rather than use the Iran nuclear accord to demonstrate the power of diplomacy (even if it was her successor’s doing), Clinton instead uses the deal as a prop to show how resolute she is vis à vis Iran. She repeatedly vows to audiences that under her watch Iran will never obtain a nuclear weapon. Yet who exactly says they want one? Not the Iranians. As President Obama has been at pains to point out, Iran’s supreme leader has gone so far as to issue a fatwa against the development of nuclear weapons. In San Diego she told the crowd that her preferred strategy in dealing with the Iranians is to “distrust but verify.” This is an inversion of Ronald Reagan’s famous pledge to Soviet leader Mikhail Gorbachev that he would “trust but verify” during arms-control negotiations. Is Clinton signaling she is ready to out-Reagan Reagan? In any event, “distrust but verify” can hardly be said to be a sound basis for the implementation of an international agreement. It actually sounds suspiciously like a catch phrase one would hear on reality television. Clinton promises more of the same. Indeed, at times she sounded like she was channeling the ghosts of Republican presidential candidates past. She has repeatedly claimed that if Trump wins they’ll be “celebrating in the Kremlin.” She is clearly signaling that rather than seeking to engage with Russia over issues of mutual concern like nuclear proliferation, terrorism, and climate change, she plans to continue the Obama administration’s ill-considered policy of isolation and containment toward Russia. She also made the obligatory bows to Israel, claiming (without evidence) that it is “our closest ally in the region” and that the United States has a “moral obligation to defend Israel.” She warned the adoring assembly that a world shorn of American leadership will result in chaos—indeed, it is “not an outcome we can live with.” In other words: A President Hillary Rodham Clinton will do everything in her power to defend and extend American global hegemony. And so voters are likely to be faced with a dismal choice this coming November: a choice between a candidate with a record of odious pronouncements, Trump, versus a candidate with a lousy record, Clinton. Given the options, there are of course reasons to pull the lever for Clinton come November, but she will need to be challenged by a revitalized peace-and-diplomacy movement within her party to counter her hawkish instincts. If the Sanders forces can move her leftward, towards a progressive realism, then all the better. But with apologies to Paul Simon: Any way you look at it, you lose.